An October dawn and the sun has just about pushed above the surrounding hills. We are waiting outside the Wabe hotel, hands rubbing together to ward off the cold while beyond the town awakes. We are off to the track. Yet this is no ordinary track; this is no ordinary town. This is Bekoji, the fabled “Town of Runners” 200 miles south of the Ethiopian capital Addis Ababa. 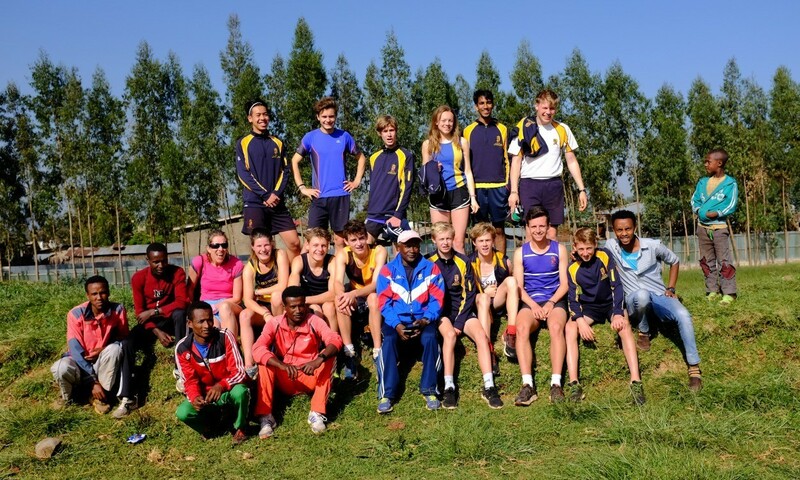 Over the autumn half-term holiday, while their peers rested at home during the two-week break, 13 pupils from Shrewsbury School travelled to East Africa for a running trip of a lifetime to the spiritual home of distance running: Kenya and Ethiopia. The school enjoys a rich heritage of running, with records going back to 1831 arguably making the school’s running club – known as The Hunt – the oldest in the world. Running is considered a major sport at the school and cross-country plays a key role in the sporting life of Shrewsbury with the annual “Tucks” race having been run by the entire school every year since the early 1830s. It is certainly an exciting club to be a part of, and the trip to East Africa was set to be a new adventure in the history of the club. In October 2014, Athletics Weekly carried a four-page feature on Shrewsbury’s coach in residence, Kenya’s Olympic gold medallist and five-time world cross-country champion John Ngugi. This was the second such coaching residency, for two years previously we had been honoured with a week-long visit to the school from Ethiopia’s legendary coach Sentayehu Eshetu, who has produced multiple Olympic gold medallists and world record-holders. Our return visit to his home town of Bekoji in Ethiopia would see us reunited with the great man and, as we flew out to Africa from a blustery autumnal England (in fact the day after the Tucks race), there was considerable excitement in the air as we prepared to train alongside Eshetu’s athletes and experience for ourselves the thrill of running among such talent. 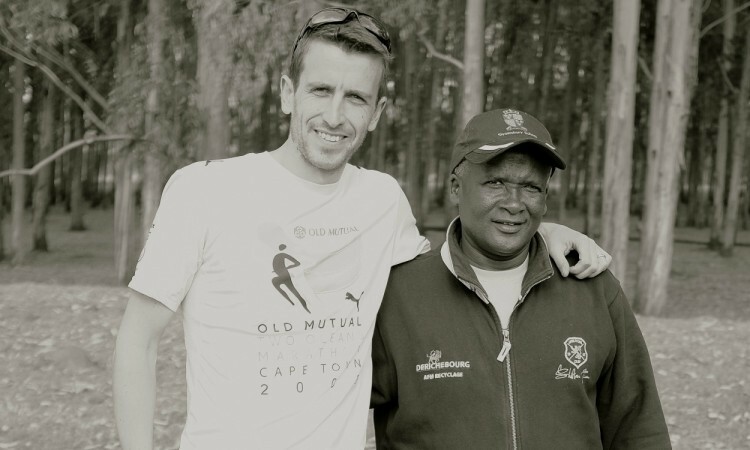 Sentayehu Eshetu (pictured below with the author of this article, Peter Middleton) is perhaps not as well known as he should be on the international running scene, though given his achievements this is somewhat surprising. As a young man, he moved from the Harar region in Ethiopia to the small town of Bekoji, a distant outpost where he intended to begin his career as a teacher and sports coach. With just 16,000 residents and few connections to the outside world, this little town’s fortunes were about to change with the discovery of a rare and exceptional talent from within their midst. A young girl in Eshetu’s school had shown promise as an athlete and the novice coach soon realised that she was really something quite special. He dedicated himself to nurturing this talent and duly prepared her for the next level. Her name was Derarta Tulu and by 1992 she had been crowned Olympic champion in the women’s 10,000m at the age of just 23. She would add to her tally with a further Olympic gold in the event at the Sydney Games in 2000, having taken a break to start a family during the years in between. Meanwhile, Fatuma Roba was also breaking new ground by becoming the first African woman to win the Olympic marathon, taking gold in the Atlanta Games of 1996. She too was born and raised in the small town of Bekoji. She too was coached and nurtured by Eshetu. This, however, was just the beginning. Two families from the town would soon catapault Bekoji into international renown with achievements that surpassed even the greats of Tulu and Roba. The year 1982 saw the birth of a superstar: Kenenisa Bekele. His achievements hardly need stating here and Bekele has of course regularly featured among the list of “greatest” distance runners of all time. To summarise: three Olympic golds; five World Championships golds; the most decorated runner in the history of the IAAF World Cross-Country Championships with six long-course titles and five short-course titles; current world record-holder over 5000m (12:37.35) and 10,000m (26:17.53). He too was born, bred, raised and coached in Bekoji. Lest we forget, younger brother Tariku is no slouch either with an Olympic bronze medal to his name from London 2012 in the 10,000m and a gold medal from the World Indoor 3000m in 2008. Another Bekoji success story. Then of course there are the Dibaba sisters, and yes, you’ve guessed it, they’re from Bekoji as well. First came Ejegayehu Dibaba, a classmate of Kenenisa Bekele and born the same year. The “forgotten sister”, she nevertheless scooped up an Olympic silver medal in the 10,000m at Athens in 2004 and two World Championships bronze medals. Yet it was her younger sister Tirunesh who was to set the world alight; alongside Bekele, she is regarded as Eshetu’s greatest prodigy. Her talent having been spotted and nurtured by ‘Coach’ (as he is known to everyone), Dibaba was set for great things. First making her mark in 2003 with victory in the junior race at the World Cross Country Championships, that same year she won her first senior gold on the track in the World Championships in the 5000m. It was the first of five world golds (matching her five global cross-country titles), but it was in 2008 that the world really stood up and took note. At the Beijing Olympics, Dibaba took home double gold in the 5000m and the 10,000m, the latter of which she defended successfully at London 2012. She is certainly among the greatest female distance runners of all time – if not the greatest – with her world record of 14:11.15 for the 5000m set in 2008 still standing. Of course, in recent years, younger sister Genzebe has been threatening to match those achievements and perhaps even surpass them. At the age of 24, she already holds three indoor world records and in July last year, during a night of high drama in Monaco, she achieved what many had said impossible and broke the women’s 1500m world record, lowering Qu Yunxia’s mark to 3:50.07. It was a quite remarkable race and no doubt she’ll be eyeing up Olympic gold in 2016 as she aims to add to the family’s bulging treasury of medals and trophies. Bekoji born and bred, the Dibaba sisters have carried the torch for the town in cementing its place as one of the great breeding grounds of distance talent. Indeed, the list of Bekoji athletes could go on and on (among others, the women’s marathon champion from London 2012 Tiki Gelana is yet another Olympic gold medallist to hail from the town); what is clear is that this is a quite astonishing success story from a town with the same number of inhabitants as Cirencester. The question remains, therefore, what is it about this small town that has led to such an impressive conveyor belt of talent emerging from the area? This was a question that we hoped to explore as we spent time in the town during our stay. As we arrived at the track on that cold October morning, the first thing that became clear was that the success of Bekoji athletes was not due to facilities in the town. Indeed, the running track is about all they have and it is in an appalling state. Stony, bumpy, and with predatory grass invading as far as lane three in parts, this is not exactly conducive to running quick times. Compare that to the facilities in Kenya’s self-proclaimed “home of champions”, Iten, where these days there is a top-end tartan track in the town. Even the legendary Kamariny track that perches on the escarpment of the Great Rift Valley, while allegedly 410m in distance, nevertheless allows for fluent running. Many athletes in Iten these days also take advantage of the gym and core area at the Lornah Kiplagat High Altitude Training Centre (indeed, during our stay in Iten we bumped into Emmanuel Mutai, the second fastest marathon runner of all time, following his session at the gym). There are no such facilities in Bekoji and I doubt very much whether the athletes (or indeed Coach) would even know what “core” was. This is a town where the principle form of transport is still horse and cart and whose connection with the outside world is limited. Of course, that is part of its charm and perhaps, part of the reason for its success. Training here is simple and hardly revolutionary, but it is guided by a principle of hard work and high standards. 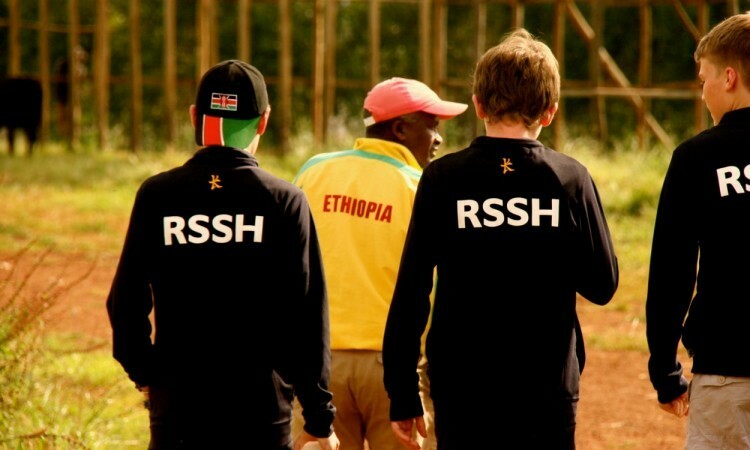 Much like Brother Colm O’Connell in Iten, Coach is largely self-taught and has very much learnt on the job, but instils in his young athletes a dedication and belief that is quite palpable when watching them run and train. Their training shoes hang by threads and many will train while insufficiently nourished, yet week in week out, more than 100 athletes between the ages of 16 and 30 will turn up at the crack of dawn for one of Coach’s sessions, whether on the track or in the nearby eucalyptus forests. Each and every one of these athletes believes they could be the next Bekele or the next Dibaba, each and every one believes in dreaming big. It is a route out, a means of escaping a remote town with few opportunities and little prospects beyond small-scale farming and roadside industries. They believe that if they work hard enough, train hard enough, fight hard enough, then they will make it. In his book More Fire, Toby Tanser argues that self-belief is a key factor in the success of an athlete. While focusing specifically on Kenyan runners, the principle is true of Ethiopian athletes, too, particularly so in Bekoji. Their success is certainly not down to revolutionary training methods, nor cutting-edge technology and sports science. You won’t find a sports psychologist in the town, nor a physio, nor a nutritionist. Like the Kenyans, the Ethiopian diet is simple, in their case centering around the staple diet of injera, a sourdough flatbread with a slightly spongy texture and a culinary experience probably best avoided in my view. Along with the traditional barley juice that many swear by, the simplicity of the Bekoji athlete’s diet is perhaps a factor, but it would be a small factor and not the deciding one. Some would argue that the altitude is key (sitting at 10,000ft, Bekoji is considerably higher than the main training bases in Kenya) and of course there have been many scientific studies to examine the East African physique with some pointing to the unique physiology as being one of the key factors in the success of Ethiopian and Kenyan athletes. All this may well be true, but it doesn’t explain why this one particular town in the Arsi region of Ethiopia has produced so many champions. There are plenty of other much larger towns in the country where all those factors would also be true of their young runners. So why haven’t they produced a Bekele or a Dibaba? The answer, I believe, is down to one man: Coach Eshetu. As depicted in Jerry Rothwell’s 2012 feature-length documentary Town of Runners, Coach’s role in the fortunes of the town’s famous athletes is a crucial one. As he walks through the streets of Bekoji, it is clear to see that the town holds him in high esteem. For his athletes, he is widely regarded as something of a guru, a coaching wizard who has propelled lowly rural farmers’ sons and daughters into international superstars. There is, however, no alchemy in the process, more a gift for talent-spotting and a dedication to developing and nurturing talent. Coach has detailed records and data on each and every one of his athletes no matter their age, no matter their talent. He possesses a unique blend of approachability and gravitas that creates a certain mystique about his person, and it is hard not to be spellbound in his presence. Watching my own young athletes train under his guidance, it was clear to see the impact Coach had on them, even during such a short space of time. Crucially, he paid attention to each and every one of them, ensured he encouraged them and made a point of saying well done to them individually after each session. It’s just part of his skill as a leader and no different to what any coach in the UK will be doing, but the impact of an action so small as this from someone so great is not to be underestimated. As a coach myself, Eshetu is an inspiration and in my view he is one of the greatest coaches of all time. It may pose an interesting question to debate over the coming months, and I am sure Athletics Weekly readers will have their own views. For me, it would be hard to find a coach with such an impressive record for discovering athletes and nurturing their considerable talent. For so many of Ethiopia’s great athletes to have emerged from this one small town in a remote outpost of the country is nothing short of remarkable, and I do not doubt for one minute that this cradle of champions will continue to produce more superstars. And as long as Coach is still there, these prodigies will continue to be spotted and their potential realised. Above all, Coach demonstrates to all of us who seek to inspire young athletes that nothing beats enthusiasm and passion for the sport and a dedicated, selfless approach. So many coaches in the UK have all these qualities and it is perhaps often forgotten the role they play, whether they are national coaches or those who give up their time week in week out, in rain and in snow, to inspire the next generation of youngsters. We might not be able to rattle off the names of Olympic medallists and world record-holders among our former charges, but if we have inspired but one young athlete and given them a passion for life, then we, like Coach Eshetu, have done our job. NextWin a trip to the European Champs as a Brooks Super Fan!